The first time I applied to a gallery, I included portraits, landscapes, and still lifes, framed in a multiplicity of styles. My work was not accepted, but the gallery manager was kind enough to give me some advice: develop a cohesive body of work. From my voracious reading of art books, I knew that one way to do this was to work in a series. But I didn't want to work in a series. In my mind, working in a series equated to backtracking and repetition. Ugh. There were so many, many things to paint, and having come to it late, I was striving to catch up. I didn't have time to waste. Oh, how wrong I was! Working in a series is not about repetition, it's about deep-diving. Settling in and taking some time to explore the corners or your idea. Each successive piece illuminates and defines the original concept in a slightly different way. It's not repetition, it's subtle shifts. Nuance attracts me, like a moth to a flame. Here are a couple of examples of recent series, both of which happen to be groups of three... not a requirement! The goal for this was to push my color a bit; not to make it more saturated, or vibrant (my work is that way, already), but just be unexpected. This was about taking the original thought and pushing the composition. I got a little lost in the reds, here. I love it. First "6-panel" ever, it was 36x108" long. Don't know what possessed me. It let to this 20x60" 6-panel painting. I was interested in doing a very green refections scene. Keeping within the 6-panel format, up to my usual tricks with slanted horizons, which I think make a fascinating contrast to the vertical lines separating the panels. How many ways can I paint the same scene? I haven't found out the answer yet, but evidently, a lot! The original inspiration for these came from a few shots I took of the Deschutes River, near Bend, OR, years ago... I keep finding new ways to paint the scene, and enjoying every moment. I've split it into panels, made the trees at times deciduous and at others evergreen, made the water still or rippling, included the sky... or not, background mountains... or not, painted it in morning, evening & daytime light... and I doubt I'm done, either. One of the hardest things for me to do is write a process statement, which many shows require. 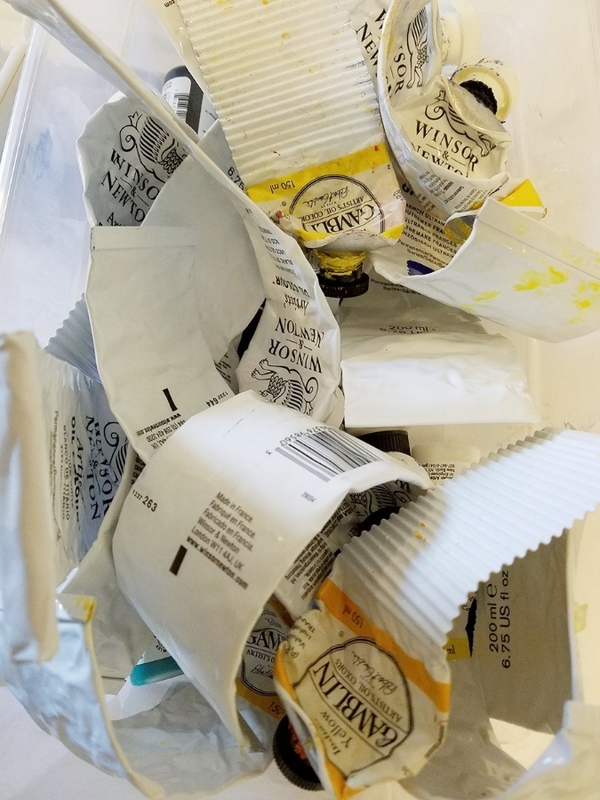 I have, um, several processes and it's rather random which one I use on any given painting. My main process is Whatever the Painting Calls For, which is not a good answer to the question. One of my methods is Painting in Layers, often involving a technique called Back to Front, possibly in combination with Top to Bottom, and sometimes including Underpainting or Color Sketching. But not always. Sometimes it's Middle Out and others it's Light to Dark. Or Dark to Light. Oh, and Grid & Transfer, not to mention Diving Right In Without Bothering to Sketch. In any case, one thing that plagues all of my methods, with the possible exception of Section by Section, is Forgetfulness. I really hate this method, but it loves me. This aversion to carries over into my painting practice. Plein air (on location) works have always been hit-or-miss ventures. Last week I signed 42 paintings. In one day. Why? Because I had 36 abstract pieces from my residency, all stretched & varnished and ready to go except for a signature, plus the six landscapes I'd completed since getting into my temporary studio digs. And because I always put off signing my paintings until the last minute. The last minute (a show that weekend) had arrived. And the only thing I hate about art is signing my paintings. I have decided. I shall start blogging. Again. (More on that, below. **) I've always liked to write and have always hated it, too. How is it you can have so much to say and then nothing occurs to you as soon as you're in front of a keyboard? And isn't it a bit much, anyway, trying to be an artist and a writer? Well. I recently spent a month in Vermont doing an art residency and as part of my social contract with supporters, I wrote a daily update of my progress. It was intimidating at first, but I grew to enjoy the feeling of debriefing to an interested party(ies). I also found that writing about the art I was making helped me to clarify my own thoughts about it. So here I go again! **If you are interested in reading what the previous iteration of blogger-me had to say, you can find it at http://rachelharveyartist.blogspot.com/. I was pretty hit-and miss throughout, and I no longer maintain it, but it's out there in the ether still. The last "real" entry was in May 2012. Woohoo, I figured out how to do music with this one. ;) Enjoy! It was fun to go back and watch this. I hope you enjoy it!